The Government of the Federated States of Micronesia (FSM), through its Permanent Mission to the United Nations in New York, had on 4 August 2017, registered with the United Nations a Treaty between the Federated States of Micronesia and the Republic of the Marshall Islands (RMI) concerning maritime boundaries and cooperation on related matters. The Treaty signed in Majuro, the Capital of the RMI on 5 July 2006, came into force in accordance with its article 7 on 24 July 2015. Two other treaties which the FSM Government had also entered into were also registered with the UN on 8 November 2017. These include the Treaty with the Republic of Palau concerning maritime boundaries and cooperation on related matters, signed on 6 July 2005, also concluded in Majuro, and the Amended Treaty between the Federated States of Micronesia and the Independent State of Papua New Guinea concerning maritime boundaries and cooperation on related matters. The amended treaty was signed in Port Moresby on 7 September 2015. The treaties were registered by the FSM Government with the United Nations pursuant to Article 102 of the Charter of the United Nations which requires every treaty and every international agreement entered into by a Member of the United Nations to be registered with, and published by the Secretariat. Article 102 further gives publicity to all treaties and international agreements subject to registration. An additional treaty yet to be registered is that with the United States of America (US) for the maritime boundary between the FSM and Guam. The registration is awaiting domestic ratification by the US. The registration of the treaties is another significant achievement by the FSM in defining the extent of its maritime space. This followed FSM’s achievement in extending its normal continental shelf (seabed) beyond the limits of its Exclusive Economic Zone through the joint extended continental shelf submission to the United Nations by the FSM, Papua New Guinea and the Solomon Islands with respect to the Ontong Java Plateau. The Ontong Java Plateau is a massive mountain range that lies beneath the high seas between the FSM, Nauru, Solomon Islands and Papua New Guinea. Read more at Pacific Islands Tuna Industry Association. With the introduction of the Vessel Day Scheme and the annual increases in fishing access fees, fishing companies accessing FSM’s Exclusive Economic Zone (EEZ) have expressed greater interest in establishing tuna processing plants in the FSM in order to qualify for special considerations on access fees and reduce operational costs. The NORMA Board met with several companies with proposals to establish cold storage facilities in Kosrae as well as loin processing plants in both Kosrae and Pohnpei. It is anticipated that these projects would generate 150-800 employees. In all the presentations given, the common message from the fishing companies was the critical need and urgency to have a Competent Authority for IUU and Health Safety established in the FSM. Most of the distant water nation fleets fishing in the region export their catch to the EU market, which is currently the most lucrative market for fish products. Companies who have voiced their interest in investing in the FSM are among those fleet. They all stressed during the meeting that their investments would be contingent upon the establishment of the CA. The CA for IUU and Health and Food Safety are market access requirements set by the EU for Countries that wish to export fish into its market. The CA ensures that fish exported into the EU are sustainably caught and are safe for consumption. The only Countries in the Pacific region that have managed to establish a CA are PNG, Fiji, and recently, the small island nation of Kiribati. With the growing interest to invest in the fisheries sector in the FSM, it is imperative that a CA be established soon. NORMA, with support from World Bank under the PROP Project and assistance from New Zealand under a Technical Assistance Project, aims to achieve that within two years. 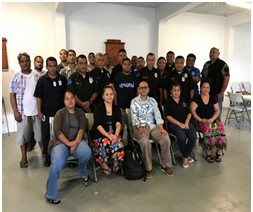 On October 9, 2017, staff from the FSM Department of Justice (DOJ) Maritime Surveillance Wing and the National Oceanic Resource Management Authority (NORMA) gathered at the Western and Central Pacific Fisheries Commission Annex Building for Monitoring, Control and Surveillance (MCS) training. 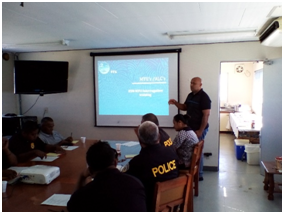 The week-long training, conducted by experts from the Forum Fisheries Agency (FFA) based in Honiara, Solomon Islands, allowed FSM’s maritime enforcement officers and fisheries compliance staff to upgrade their skills on use of the Regional Satellite Vessel Monitoring System (VMS). The VMS is one of the key MCS tools utilized by FFA members to monitor fishing vessels in their Exclusive Economic Zones (EEZ). 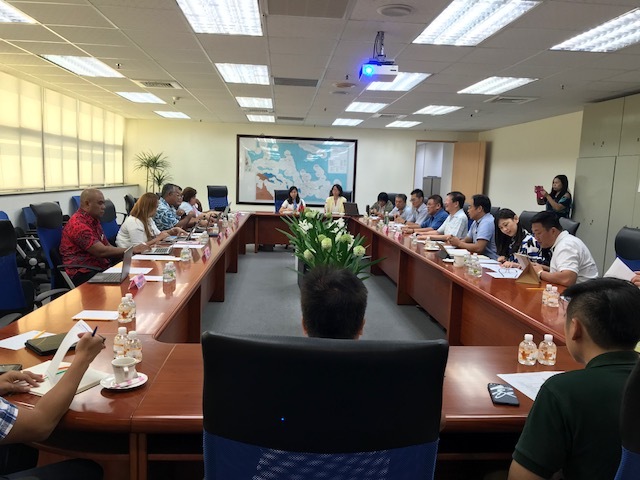 The training was officially opened by NORMA Executive Director, Mr. Eugene Pangelinan, who noted that continual upgrading of systems and skills are essential to an effective fisheries management regime. Mr. Pangelinan highlighted the significant work in fisheries management that has been accomplished over the past decade as a result of the VMS and encouraged participants to absorb as much knowledge as they could from the regional FFA experts as well as FSM’s own in-country experts, VMS Officers Mr. Justino Helgen from NORMA and Mr. Whylik Alfons from DOJ. The training was part of a series of MCS exercises that the FSM requested as part of its Country Service Agreement with FFA and an in-country roll-out of the recently upgraded VMS. Training participants expressed their appreciation for the timeliness and relevance of the training to the FSM, which would aid in carrying out daily MCS tasks, providing policy advice and planning maritime operational activities. The VMS training focused on teaching officers the functionality of various modules on the new VMS Trackwell System and how to operate it to combat, prevent, deter and eliminate Illegal, Unreported and Unregulated (IUU) fishing in FSM’s multi-million dollar generating EEZ.